Hope that you have all been ok with the bad weather once again!!! Its much more settled now here and actually looks like spring is on her way!!! Still chilly but at least the snows gone!! Bugaboo Digi - Cant find it instore now. Die Sentiment - Creative Crafting World. Hazel, just love the rainbow worm. This guy looks just too happy. Love the sparkle. Thanks for joining the Stella Says Sketch Challenge, Lisa Lynn DT. This is ABSOLUTELY darling!! Great ideas Hazel! I just LOVE this card - the little worm is adorable! 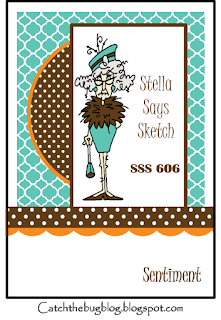 Thanks so much for playin' along with the Bugaboo Stamps/Catch The Bug Blog Stella Says Sketch Challenge! We hope you'll join us today for our newest sketchy challenge!